French newspapers today only have one headline, the anger that is spreading about rising fuel prices. They want to paralyze traffic in more than 500 places in the country on 17 November as part of a nationwide protest. President Emmanuel Macron says he understands the anger, but does not want to give in, saying: "I prefer to charge extra taxes on fuel than on work." "Send all your fuel bills to Macron." That call from a motor vehicle association is currently being massively heard in France. The French are furious about the ever rising fuel prices. In the past year, the diesel price has gone up by 23 percent, and petrol by 15 percent. A liter of diesel now costs more than €1,60 ($1,84). As a symbol of dissatisfaction, yellow safety vests appear on car windows throughout France. French motorists have now decided to block motorways and petrol stations throughout the country on 17 November. Related coverage: <a href="https://thegoldwater.com/news/40998-France-Shock-Scandal-Over-Ain-Region-Babies-Born-Without-Arms">France – Shock Scandal Over ‘Ain’ Region Babies Born Without Arms</a>. Even the large supermarket chains support the population. For example, the Leclerc group sells its fuel at purchase prices in protest without taking any profit on it. "The displeasure of today is justified. It is important that we send a clear signal to the government," says chairman Michel-Édouard Leclerc. The supermarket chain Carrefour is also taking action and is selling fuel to purchase prices until November 17th. Remarkably, this translates into a discount of 'only' 2 to 10 cents per liter. That relatively small difference makes it clear that it is not the service stations that are going to run the big profit. After all, the fuel price in France consists of 60 percent of taxes. And those prices are going to rise. From January 2019 there will be an increase in the tax on fuel. The French are not gonna take it any longer: an opinion poll shows that 78 percent of the population is behind the demonstration. President Macron doesn’t want to listen though. He "prefers extra taxes on fuel than on work". According to him, the price increase has an ecological reason: he wants as few diesel cars on the French roads as possible. In 2011, 70 percent of French cars still had a diesel engine, now that's only 39 percent. But that decline is not enough for Macron. The French President emphasizes that the conversion of the French car fleet is necessary, but the population also understands: "For decades we have urged everyone to buy a diesel engine and now we say the opposite. They feel trapped and find it unfair. " 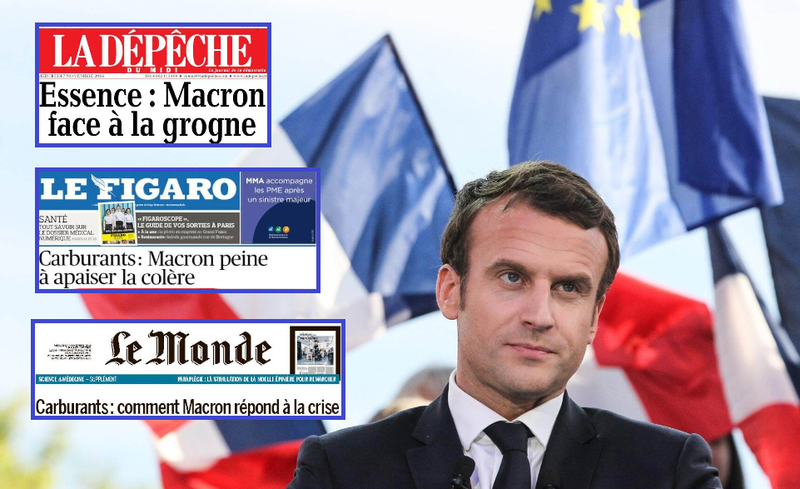 Macron. Another parasite on society.